My current research is in the exploration of ionic liquid stable proteins and enzymes. Primarily, this will be focussed on tailoring solvent-free liquid proteins to maximise their compatibility with ionic liquids. However, I will begin to develop novel methods of protein engineering to maximise solubility, structure, and enzymatic capability. The aim of this research will be to provide new platforms for nonaqueous biocatalysis, particularly with the scope of enhancing the profitability of lignocellulosic biomass processing. Extending my work on solvent-free liquid proteins, I investigated whether it was possible to first solubilize proteins in hydrophilic and hydrophobic ionic liquids. It was indeed possible, through modification of the surface of myoglobin, to solubilize the dry protein in both hydrophilic (Figure 1b) and hydrophobic (Figure 1d) ionic liquids. This was in stark comparison to the ability of the ionic liquids to solubilize unmodified myoglobin, which resulted in, at best, heterogeneous mixtures with partial solubility. Figure 1. (a) Myoglobin in hydrophilic ionic liquid (b) Modified myoglobin in hydrophilic ionic liquid (c) Myoglobin in hydrophobic ionic liquid (d) Modified myoglobin in hydrophobic ionic liquid. Remarkably, the structure of the modified myoglobin in both the hydrophilic and hydrophobic ionic liquids increased from the aqueous structure, with SRCD spectra showing an increase in α-helix content (Figure 2). This indicated that not only was the modified protein soluble in anhydrous ionic liquids, but that the surfactant corona allowed for interactions such that structural integrity was increased. Figure 2. 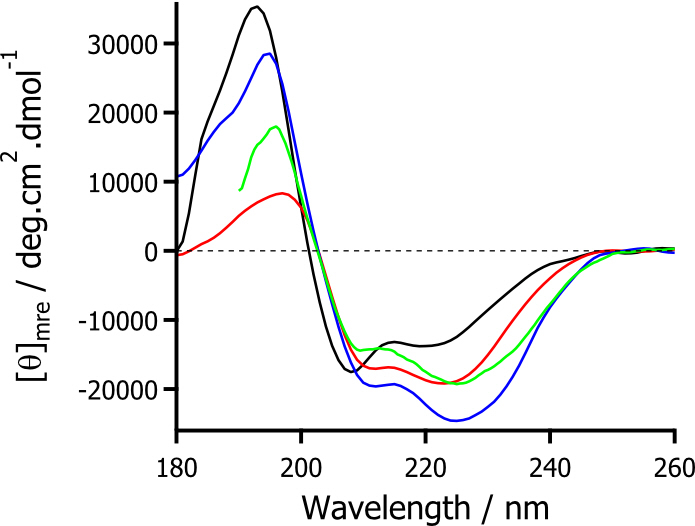 SRCD spectra for modified myoglobin in aqueous solution (black), solvent-free liquid state (red), hydrophilic ionic liquid (blue), and hydrophobic ionic liquid (green). 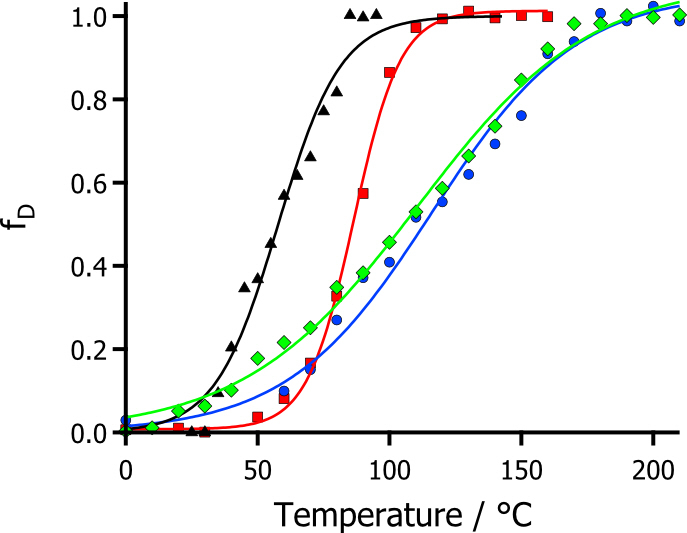 This increase in structure in the ionic liquids, perhaps unsurprisingly, was transferred to an increase in the thermal stability of the modified protein (Figure 3). Where using SRCD, the equilibrium thermal denaturation could be monitored. This showed that moving into ionic liquid phase increased the thermal stability from the aqueous phase by up to 55 °C. As a result, this could provide a pathway for the realization of biocatalysis in water free ionic liquid systems, which can utilize the fantastic solvent properties of ionic liquids, at temperatures exceeding those possible in water. Figure 2. Plots of fraction denatured showing modified myoglobin in aqueous solution (black), solvent-free liquid state (red), hydrophilic ionic liquid (blue), and hydrophobic ionic liquid (green).